Full text access is free in HTML pages; however the journal allows PDF accesss only to users from developing countries and paid subscribers. The placement of endosseous implants in posterior edentulous maxilla is normally a challenging task in implant dentistry due to maxillary sinus pneumatization. Various sinus augmentation techniques have been used with impressive success rates aimed at developing these sites for implant placement. Knowledge of anatomy of maxillary sinus guides us not only in proper preoperative treatment planning but also helps us to avoid the possible complications that may arise during sinus augmentation procedure. This topic attracts a rising number of publications with most of them reporting results that suggest, the patients with atrophic maxillae requiring implant treatment can benefit considerably from the use of sinus augmentation. This article explains the basic techniques, namely, direct and indirect techniques used for maxillary sinus elevation and augmentation. Context: Connective tissue devastation in periodontitis and other chronic inflammatory diseases is a major concern. There are several inflammatory mediators associated with this process among which matrix metalloproteinases (MMPs) play a predominant role. Collagen degradation is primarily mediated by the collagenases. MMP-13 is familiar as collagenase-3, which has the aptitude to humiliate fibrillar collagen. Aims: This study aims to evaluate MMP-13 promoter polymorphism, 11A/12A, and −77A/G and associated alleles in patients with and without chronic periodontitis (CP). Settings and Design: This was an observational case–control study. 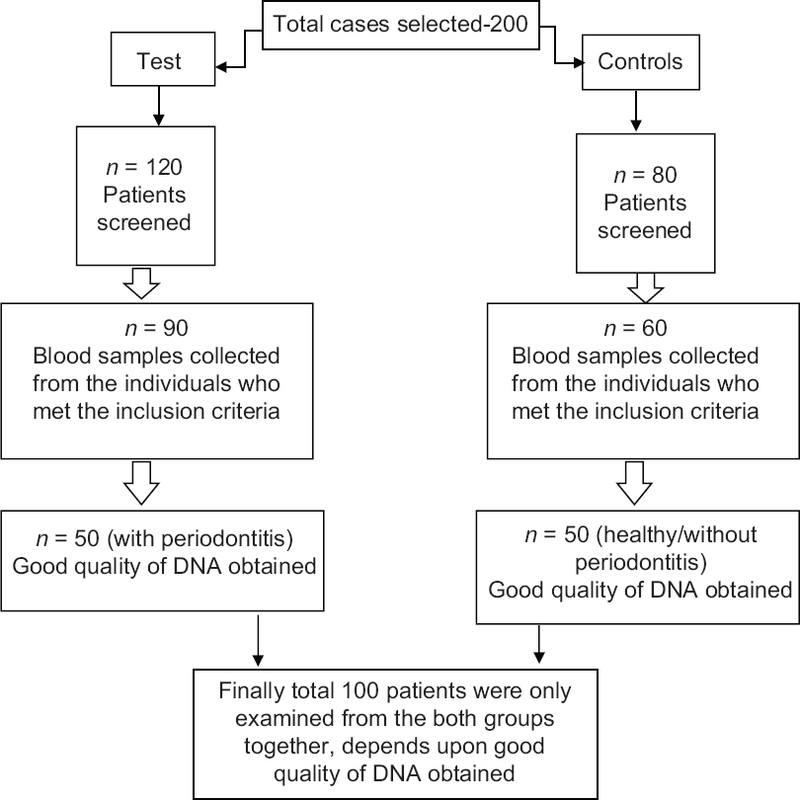 Materials and Methods: Of the total 100 patients, 50 with CP (test group) and 50 without CP (Control group), blood was collected for deoxyribonucleic acid isolation. The 11A/12A and −77A/G polymorphisms of the MMP-13 gene were picked out by polymerase chain reaction (PCR)- single-strand conformation polymorphism analysis method and PCR-restriction fragment length polymorphism by BseNI restriction enzyme, respectively. Statistical Analysis Used: Association between MMP-13 genotype (GTs) (11A/12A, 11A/11A, 12A/12A) and (AA, AG, GG) was assessed by Chi-square and Student's t-test for intergroup comparison. Results: 11A/12A GT was seen in 24% and 20%, 11A/11A 64% and 72%, 12A/12A 12% and 8% in test and control groups, respectively. However, the association was not statistically significant. −77A/G polymorphism associated GT s AA was 56% and 62%, AG 24% and 28%, GG 20% and 10% in test and controls, respectively. An association of GG was statistically significant. Conclusion: The present study results indicated that MMP-13 −77A/G gene polymorphisms, GG GT may be predicted intensive ability for CP. On the other hand, there was no significant association between MMP-13 11A/12A gene polymorphisms with CP. Background: In both states of health and disease, the integrity of connective tissue along with regulation in formation of bones are well maintained by periostin (POSTN) which is a matricellular protein secreted by fibroblasts. The present study aimed to assess the gingival crevicular fluid (GCF) POSTN levels in patients with chronic periodontitis (CP) and aggressive periodontitis and to compare them with that of healthy controls. Materials and Methods: A total of 39 individuals were recruited and allocated into the healthy group, and two periodontitis groups (the chronic and the aggressive types) (13 in each group). The samples of GCF fluid were collected using microcapillary pipette. The POSTN levels were estimated using the enzyme-linked immunosorbent assay. Results: The mean levels of total POSTN in GCF fluid (in pg/μl) were 182.41, 79.87, and 49.28 for the healthy, CP, aggressive periodontitis groups, respectively. There was a statistically significant difference between the groups with P < 0.05. Furthermore, there were statistically significant differences when compared among the groups with P < 0.05. When all three groups were examined together, there were negative correlations between GCF POSTN levels and clinical parameters. Conclusion: The GCF POSTN levels reduced with an increase in the severity of the periodontitis. With the present study results, we could conclude that the GCF POSTN level can be considered as a dependable marker in periodontal disease diagnosis, disease activity, and healing. Background: The traditional method of diagnosing periodontitis includes the assessment of clinical parameters and radiographic aids to evaluate the periodontal tissue destruction. Saliva has the potential to be used as the diagnostic fluid for oral disease. This study aimed at comparing the quantitative levels of alkaline phosphatase (ALP) in saliva and serum before and after scaling and root planing in patients with chronic generalized periodontitis. Materials and Methods: A total number of 50 participants (40 with chronic generalized periodontitis and 10 periodontally healthy volunteers) of 30–50 years were included in the study. Clinical parameters such as simplified oral hygiene index (OHI-S), gingival index, probing depth, and clinical attachment loss (CAL) were measured, and then, saliva and blood sample collection was done and analyzed for ALP levels by spectrometry. The clinical parameters along with saliva and serum ALP levels were reevaluated after 30 days following Phase I periodontal therapy. The results were statistically analyzed using paired t-test and one-way ANOVA. Results: The saliva and serum ALP levels were significantly increased in patients with chronic generalized periodontitis with an increase in clinical parameters such as OHI-S, gingival index, probing depth, and CAL when compared with periodontally healthy individuals. 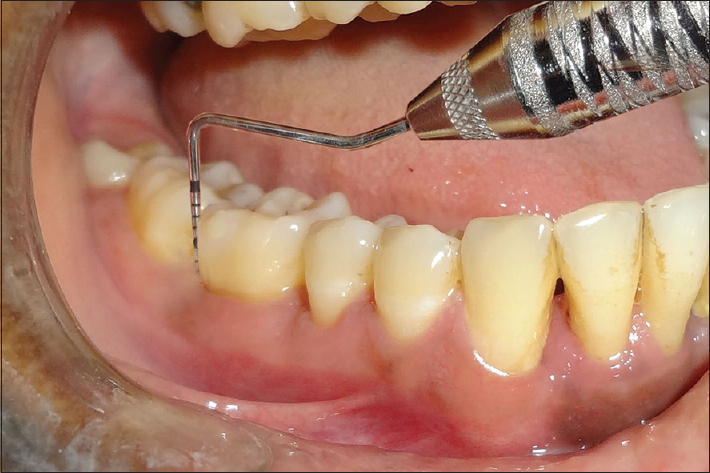 The saliva and serum ALP levels were significantly decreased following Phase I periodontal, therapy along with improvement in clinical parameters. Conclusion: With the limitations of the present study, it could be concluded that ALP levels in saliva can be used for the diagnosis of active phase of periodontal disease and also for evaluation of the treatment outcomes following Phase I periodontal therapy. Background: Due to high prevalence and progression of infrabony defects lead to increase in the possibility of tooth loss. Various regenerative techniques such as guided tissue regeneration, bone grafts, and biomimetic agents have been proposed. 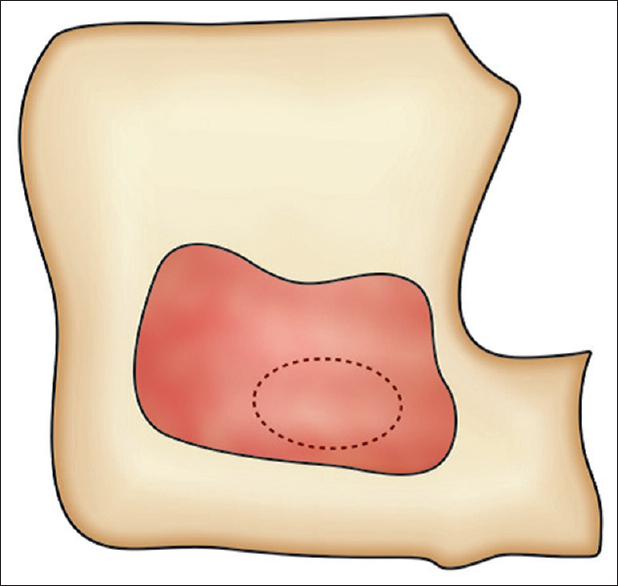 Subepithelial connective tissue graft (SCTG) is an autogenous membrane, which contains mesenchymal cells and has osteogenic, chondrogenic, and osteoblastic activities. The present study investigates the effective application of SCTG as an autogenous barrier membrane in the treatment of periodontal infrabony defect. 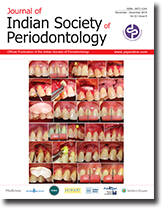 Materials and Methods: Ten patients in the age group of 30–45 years suffering from chronic periodontitis with clinical and radiographic evidence of vertical defects were selected for the study. Clinical parameters evaluated were gingival index, plaque index, probing pocket depth, clinical attachment level, and gingival recession. These parameters were assessed at baseline, 6 and 9 months. Radiographic parameter (defect fill) was evaluated at baseline, 6, and 9 months postoperatively. Sites were treated with PERIOGLAS® and connective tissue graft. Statistical analysis was done using paired t-test. Results: All the patients finished the study. A significant improvement was observed regarding clinical parameters from baseline to 9 months. The radiographic defect fill was seen in all the cases at the end of 9 months, which was statistically significant in comparison with baseline scores. Conclusion: SCTG could be effectively used as a barrier membrane for the treatment of periodontal infrabony defects. Context: Triphala has been extensively used in dentistry as a mouthwash because of its antiplaque and antigingivitis properties. Aim: The present study is designed to determine the duration of its antibacterial substantivity after a single oral rinse and to compare it with the substantivity of 0.2% chlorhexidine gluconate (CHX). Materials and Methods: In this clinical crossover trial, unstimulated saliva from 30 individuals was collected 2 h after routine oral hygiene procedures but not rinsing (pre-sample) with randomly selected mouthwash, (10% Triphala mouthwash, 0.2% CHX, and normal saline) and 5 min after rinsing (postsample). A washout period of 1 week was kept between two rinses. The sampling was repeated after every 2 h for 12 h (post 1, post 2, post 3, post 4, post 5, and post 6) and was checked for microbial count. Statistical Analysis Used: Friedman test, Kruskal–Wallis test, and post hoc analysis were used to assess the effect of different mouthrinses on colony forming units at different times. Results: Ten percent Triphala showed statistically significant results when the antibacterial effect at post, post 1 and post 2 were compared to pre-assessment count (P < 0.05). After which the effect was at par with normal saline (P > 0.05). 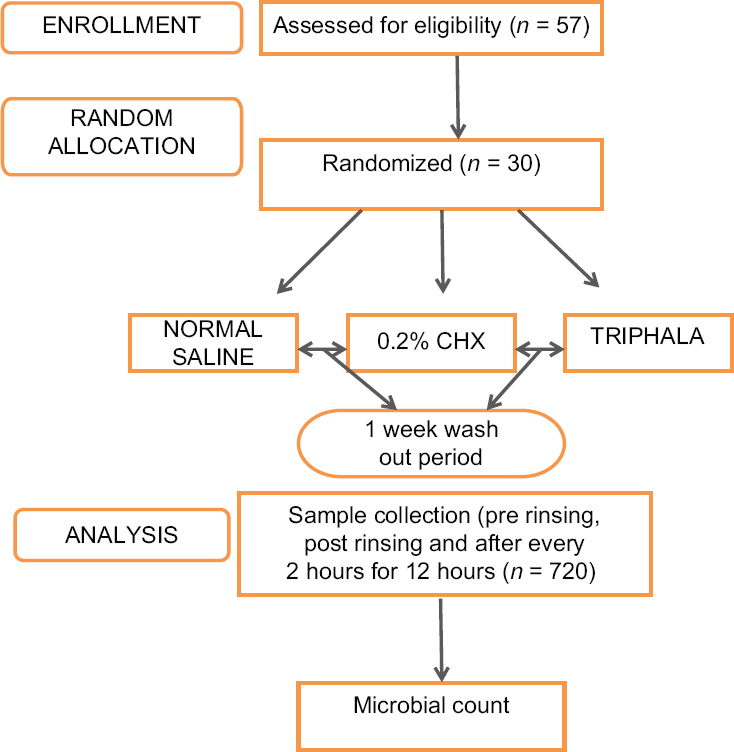 The results for CHX were statistically significant at all times when compared to pre-assessment count (P < 0.05) and it showed the maximum substantivity of 7 h. Conclusion: After a single rinse with no eating and drinking restrictions over the day, 10% Triphala mouthwash had an antibacterial effect for 3–4 h. It can be used three times daily for its maximum antibacterial effect. Background and Objectives: The periodontal regenerative techniques using growth factors and stem cells are gaining momentum in periodontics. However, relatively little is known about the biological process and the potential role of direct transplantation of autologous periodontal ligament stem cells (PDLSC) niche in promoting periodontal regeneration. Aim: The aim of this is to clinically and to radiographically evaluate the effects of direct transplantation of autologous PDLSC niche (A-PDLSc Ni) in intrabony defects. Materials and Methods: Among 28 patients, 14 sites in test group were treated with open flap debridement (OFD) followed by direct transplantation of A-PDLSc Ni and other 14 sites in control group were treated with OFD. Clinical and radiographic assessment was done for each site before surgical therapy and at intervals of 3, 6, 9, and 12 months using radiovisiography. For clinical and radiographic parameters, intragroup comparison was made by paired t-test and unpaired t-test for intergroup comparisons. Results: The result showed that significant reduction (P < 0.05) of clinical parameters in both the OFD and A-PDLSc Ni groups. Radiographic parameters such as alveolar crest changes, defect area resolution were not statistically significant in both the OFD and A-PDLSc Ni groups whereas improvement in defect density was statistically significant (P < 0.05) only in the autologous periodontal ligament stem cell niche group. Conclusion: In the present study, treatment of intrabony defect by direct transplantation of autologous periodontal ligament stem cells niche in comparison with OFD showed a significant reduction in probing pocket depth (PPD), gain in clinical attachment level, and there was no gingival recession seen owing to thick gingiva. Radiographically, there was alveolar crest improvement, decrease in defect area, and increase in defect density in A-PDLSC Ni group. 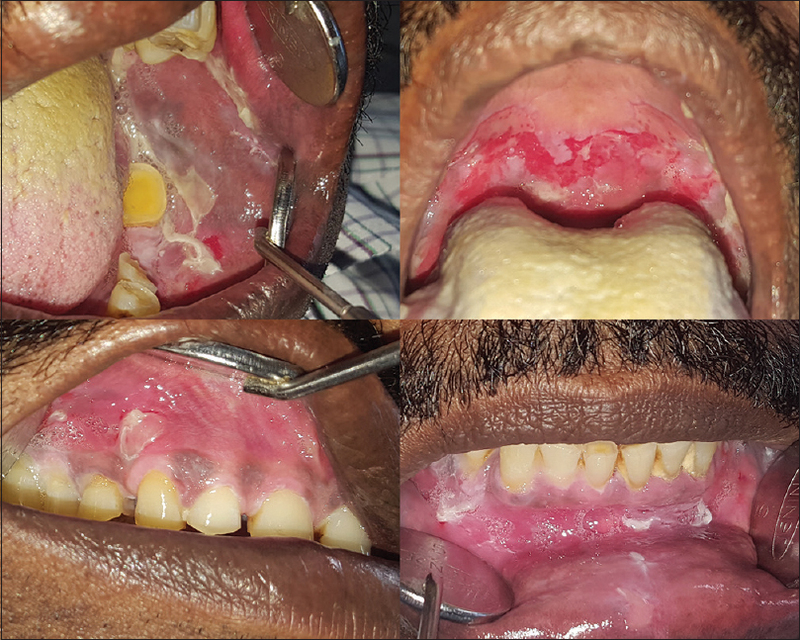 Background: Guided tissue regeneration-based root coverage has emerged as a promising treatment modality in the treatment of gingival recession. A variety of nonresorbable and bioresorbable membranes have been successfully used. Among resorbable membranes, collagen has been extensively studied. Recently, a third generation barrier membrane derived from placenta has been introduced for periodontal regeneration. Aim: The objective of the present study is to clinically compare the efficacy of placental membrane (Amnion) and collagen membrane (Healiguide) for the treatment of gingival recession. 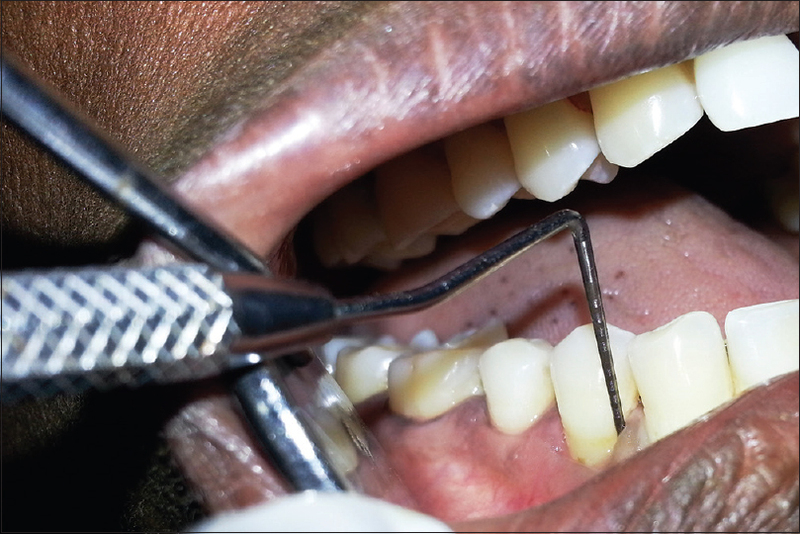 Materials and Methods: Twelve patients having isolated bilateral gingival recession defects were included in the study and were divided into two groups randomly. Group I were treated by coronally positioned flap and amnion membrane and Group II were treated by coronally positioned flap and collagen membrane (Healiguide)™. Clinical parameters, including dental plaque index (PI), gingival index (GI), gingival recession depth, probing pocket depth, clinical attachment level, and gingival biotype, were recorded before surgery at baseline and then reevaluated at 3 and 6 months postoperatively. Statistical Analysis: Nonparametric test, i.e., Wilcoxon Signed-Ranks Test was used in the present study. Significance was reported at 95% confidence level. Results: The results of the present study revealed statistically no significant difference (P > 0.05) in dental PI improved, GI and probing pocket depth in both groups. Significant reduction in gingival recession defects and gain in clinical attachment level was observed in both the groups. Intergroup comparison of gingival recession defects and clinical attachment level yielded nonsignificant differences. However, a statistically significant increase (P < 0.05) in gingival tissue thickness was observed in Group II as compared to Group I. Conclusion: Both membranes are equally efficacious in the treatment of gingival recession. More gingival tissue thickness (gingival biotype) enhancement was observed in sites treated with collagen membrane. Background: Local drug delivery is most commonly used as an adjunct to scaling and root planing (SRP) for the treatment of periodontal disease. Varied success rates have been documented for various vehicles used for intrasite delivery of active therapeutic agents. Recently, varnishes acting as a reservoir of chlorhexidine have shown potential for the management of chronic periodontitis patients. The aim of the present investigation was a comparative evaluation of the clinical effectiveness of single and multiple applications of 1% chlorhexidine and thymol varnish (Cervitec Plus) along with SRP in patients with chronic periodontitis. 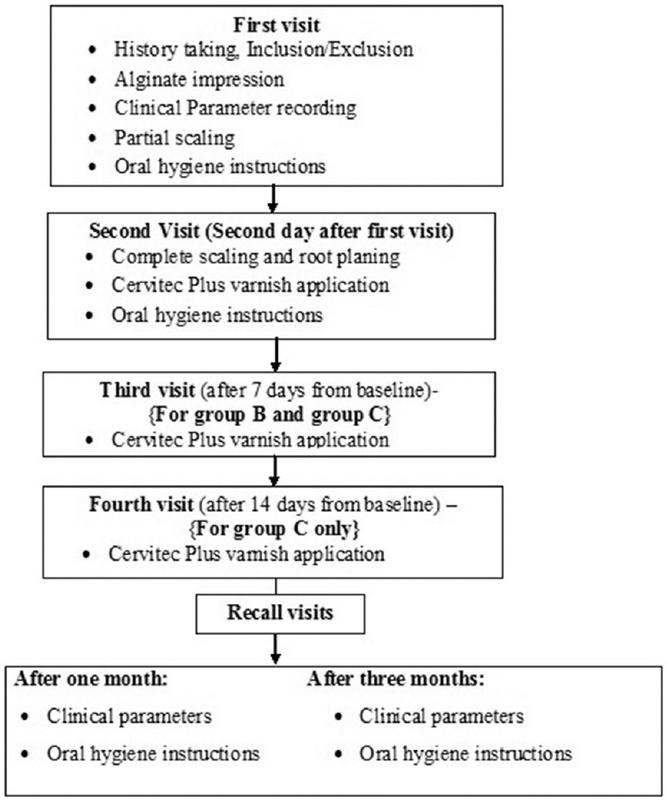 Materials and Methods: The present study included 30 patients with chronic periodontitis divided into three groups based on the number of subgingival applications of chlorhexidine varnish single application (Group A), two applications at a week's interval (Group B), and three applications with 7-day interval in between two applications (Group C). Clinical parameters, namely plaque index (PI), sulcus bleeding index, probing pocket depth (PPD), and relative attachment level (RAL) were recorded at baseline, 1 month and 3 months in all three groups to compare the clinical efficacy. Results: A statistically significant reduction was observed in PI, sulcus bleeding index, PPD, and RAL at 1 and 3 months in all the three groups. Greater (though statistically nonsignificant) improvements were observed in Groups B and C. Conclusion: Within limitations of the study, it can be concluded that multiple applications of 1% chlorhexidine and thymol varnish (Cervitec Plus) have an added benefit over the single application in the treatment of chronic periodontitis. Background: Administration of systemic antibiotics may implement persuasive treatment effect for chronic periodontitis by intending tissue-invasive bacteria in addition to accustomed nonsurgical periodontal therapy (NSPT). Aims: The aim of this study was to assess the ancillary effects of oral clarithromycin (CLM) along with NSPT for chronic periodontitis. Materials and Methods: Thirty periodontitis patients were randomly divided into two equal groups in this double-blind, randomized, parallel group, and active-controlled trial: test group – scaling and root planning (SRP) plus CLM (500 mg thrice daily for 7 days, orally) was given, and control group – only SRP was done. Clinical analysis, such as gingival index (GI), probing depth (PD), and clinical attachment loss (CAL), were taken at baseline, 3 months, and 6-month intervals for both groups. 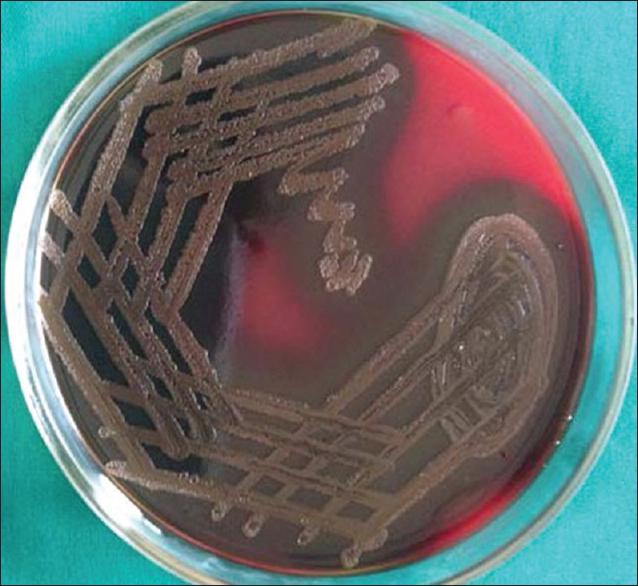 Subgingival plaque samples were cultured for periodontopathic organisms. Immunological parameter C-reactive protein (CRP) levels were estimated. Results: SPSS version 14 was used for statistical analysis. The intragroup comparison showed a significant reduction in the mean scores of all the parameters from baseline to 6 months. The intergroup comparison showed a statistically significant reduction of PD from baseline to 3 months (P < 0.001). GI, CAL, and CRP levels were also reduced but not statistically significant. The mean colony-forming units (CFU) of Aggregatibacter actinomycetemcomitans (Aa) and Porphyromonas gingivalis (Pg) showed a statistically significant reduction from baseline to 3 months only in the test group (P = 0.042) and (P = 0.046), respectively. There was no statistically significant reduction of Aa and Pg at 6 months. Conclusions: CLM conceivably accepted as an addendum to NSPT for a shorter period. Background: Thyroid hormones play a significant role in bone remodeling. However, there are few studies on the effect of these hormones on periodontium. Aim: The aim of this study was to evaluate the periodontal status of hypothyroid patients on thyroxine replacement therapy. Materials and Methods: Clinical parameters (plaque index, bleeding index, probing pocket depth [PPD], and clinical attachment level [CAL]) and radiographic parameters (Mandibular cortical width and panoramic mandibular index) were recorded in 52 hypothyroid patients on thyroxine replacement therapy (Study group) and 50 individuals without signs and symptoms of thyroid dysfunction (Control group). The effect of dosage and duration of therapy on clinical and radiographical parameters were also assessed in the study group. Results: Statistically significant higher PPD (P = 0.008) and clinical attachment loss (P = 0.032) were observed in the study group in comparison to the control group. 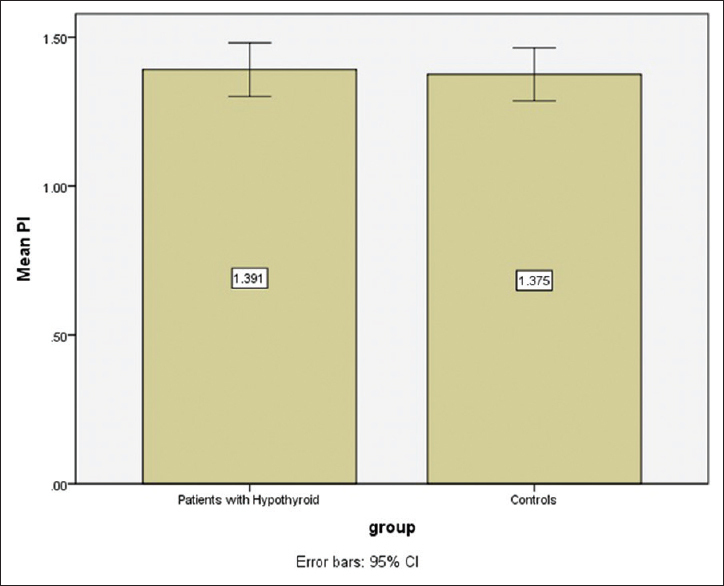 However, no significant differences were observed within the hypothyroid group with varying doses and duration of therapy. Furthermore, there was no correlation between the dosage and duration of therapy with periodontal status. Regression analysis showed that hypothyroidism and thyroxine replacement therapy was a significant predictor of PPD and CAL even after controlling for the effect of age in hypothyroid patients. Conclusion: Hypothyroid patients on thyroxine replacement therapy may be at increased risk for periodontal destruction. However, this needs to be validated through longitudinal studies. Background: Oral health and general health are interdependent which influence each other through biological, psychological, emotional, and developmental factors. As patients in Intensive Care Unit (ICU) are completely dependent on the caregivers, the knowledge, attitude, and practices of the nurses influence the recovery of patients to a greater extent. Objectives: Unfortunately, oral health problems are usually overshadowed by other serious needs in critically ill patients. In addition, nursing staff appear to perceive oral health as the most difficult part of their work, hence been a low-priority intervention. Therefore, the aim of the study was to assess the knowledge, attitude, and practices of ICU nurses on oral care in critically ill patients. Materials and Methods: A total of 200 nurses working in 21 different hospitals in Mysore, Karnataka, participated in the cross-sectional survey. The survey instrument included the demographic details, knowledge, attitude, and practice of oral care, complications in ICU due to lack of oral care, and educative programs attended. Results: Among the 200 ICU nurses, 67% had ICU experience of more than 5 years. About 94% were diploma candidates, 5% were graduates, and only 2% were postgraduates with a mean age of 27.5 years. All the participants were aware of the concept of focal infection theory and 93% knew about the potential complications associated with poor oral hygiene in ICU. About 95.5% of the nurses performed oral care after every shift change and used gauze soaked in chlorhexidine routinely. Nearly 76.5% of the participants stated mechanical obstruction as a main barrier toward oral care. Conclusion: A variety of oral care practices exist for ventilated patients but, the majority of nurses used chlorhexidine with gauze. They failed to adhere to the latest evidence-based practice despite ranking oral care as a high priority. They need to be educated to improve clinical outcomes thereby reducing the hospital mortality and stay in ICU. The gingival cyst of adult (GCA) is a rare developmental anomaly of odontogenic origin. It is asymptomatic, slow growing, and commonly seen near the canine and premolar region of mandible. The GCA is usually treated by excisional biopsy. Usually, occurrence is more common in 5th to 6th decade of life. The present case report describes a solitary GCA treated by excisional biopsy in a 76-year-old male patient which had recurred for the fourth time. This article also highlights on diagnostic process and a review of literature describing its histiogenesis, clinical, and histopathologic features of this condition. Pemphigus is an autoimmune disease affecting the skin and mucosae. Oral lesions are common and sometimes are the only manifestations of the disease. The clinical presentations of pemphigus might mimic other vesiculobullous lesions of the oral cavity. We report a case of a 60-year-old male patient who complained of erosive lesions in the oral cavity. The lesions were diagnosed as pemphigus based on histopathological examination and immunofluorescence findings. The patient did not respond to topical steroids and low doses of systemic steroids. Since the patient began developing dermatological manifestations, he was administered pulse steroid therapy. He is currently under observation and his clinical signs and symptoms show improvement, although he has developed hyperglycemia as a complication. Esthetic rehabilitation of edentulous site with horizontal ridge deficiency presents as one of the most challenging situations in implant practice. With the increase in popularity of dental implants, augmentation of the alveolar ridge and soft tissue has also become a routine procedure in most of the cases. Although hard-tissue augmentation is performed by other specialists also, a periodontist needs to master the skills of soft-tissue management to deliver esthetic and functional results in implant-supported prostheses. 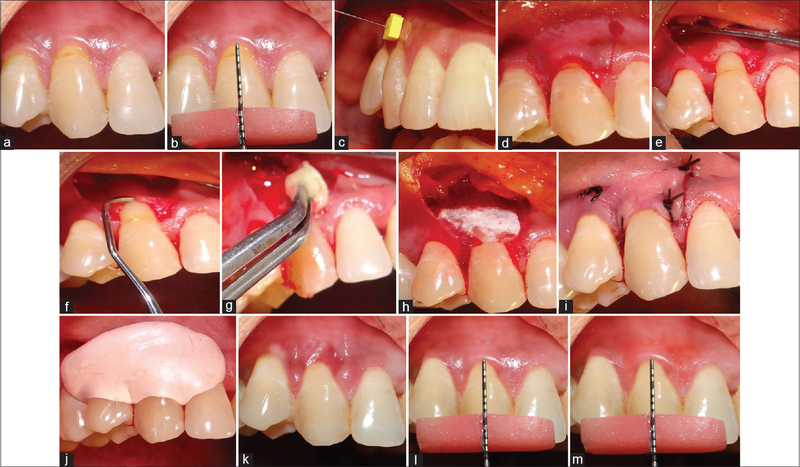 This case report presents a single-staged ridge split approach using piezoelectric surgery with simultaneous implant placement followed by connective tissue grafting at second-stage surgery. Single-staged segmental ridge split technique not only reduces the total treatment duration but also the surgical morbidity for the patient. A subepithelial connective tissue graft is strongly advocated around implants as it is highly predictable while ensuring better esthetic results in terms of tissue color, texture, and long-term stability of the surrounding mucosa.